CSE is when an abuser usually referred to as a perpetrator, manipulates, coerces or forces a child or young person into performing sexual acts. Perpetrators are usually older males, but they can sometimes be of a similar age or be female. Perpetrators are very sophisticated in the way they operate, meaning what they do is well thought out and planned. A perpetrator will know areas to target. They are skilled in approaching children or young people in person or may use a younger man or woman or boy or girl to make the initial contacts. Some use the internet or mobile phones to engage the child or young person. The perpetrators aim is to develop some form of power and control. To do this the perpetrator may use threats and/or violence, introduce them to alcohol or drugs and create a dependency, or make the child or young person feel special through attention or gifts, or pretend to be their boyfriend or girlfriend, they will also aim to alienate them from their friends and family. This is sometimes referred to as the grooming process. Because of the grooming process children or young people don’t usually know that they are being drawn into sexual exploitation or realise that the situation they are in is abuse. Every year thousands of children and young people across the UK are involved in Child Sexual Exploitation (CSE). 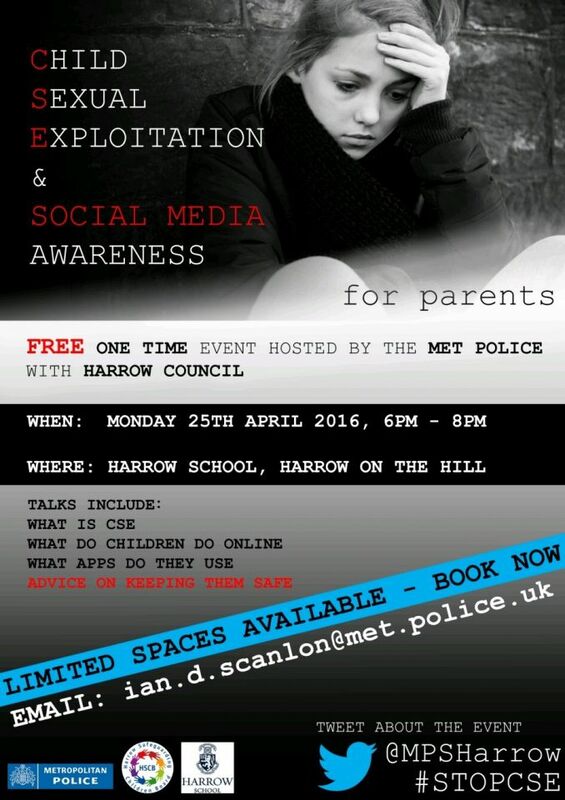 CSE can happen to any child or young person no matter what their background, culture or where they live. CSE is a form of abuse. The child or young person is a victim and under no circumstances are they to blame or at fault. What signs can a parent look for? • returning home late or going missing. • truanting or not engaging in education, reduced achievements. • having unaccounted for gifts or possessions. Try to prepare your child for life’s challenges; talk to them about healthy and unhealthy relationships, potential risks, what to look out for and who they can talk to if they are unsure. On a practical level be alert to the possible signs of CSE: how often are they returning late? where are they going? what is their behaviour like before and after? are they being picked up/dropped off by different cars? if so try and get a physical description and/or registration number. Exercise caution around older friends or associations with other young people where there appears to be a power imbalance or some form of control. Make sure you understand the risks associated with your child being on line and put measures in place to minimise these risks. We understand it can be daunting to come forward about child sexual exploitation, and it’s hard to know who to trust. Our expert staff can provide a safe, confidential environment, so victims can get all the help they need.